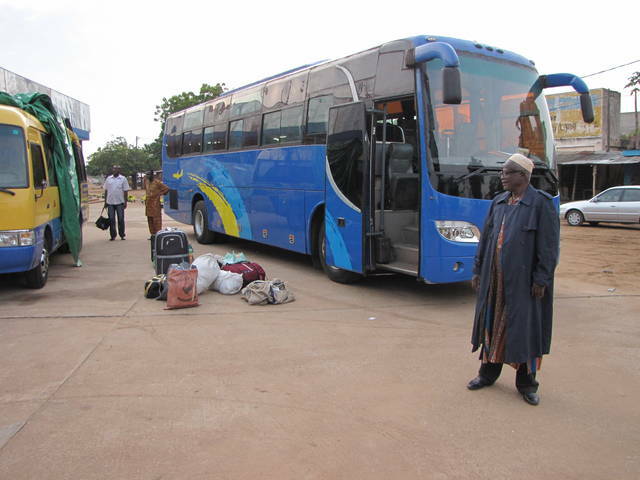 There is now as of November of 2010 there is a "Climatizé Bus" that travels from Lome to Cinkasse at the Border of Burkina Faso daily. 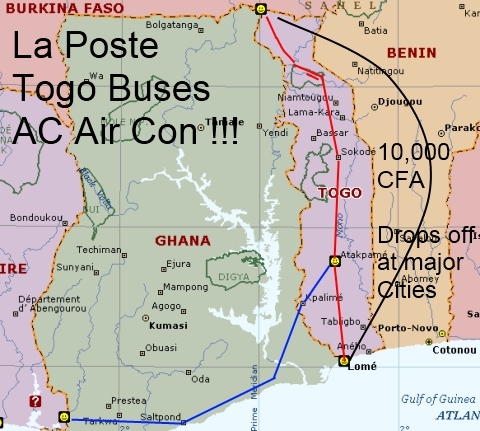 10,000 CFA or 20 Bucks from Lome to Cinkasse, and they will drop you off at many cities along the way, just go to any mail office, called "La Poste" in French. You will have to pay for your bags, they weigh them, but not much, the buses leave at 6:00 am in Lome and Cinkasse. This old guy studied English in Arizona; I was trying to politely explain I was talking a photo. He did not quite understand so he is included… hehehe. For all of you that have scrunch into a Peugeot Station Wagon in Togo where the driver is more than willing to put 5-6 people in each seating area know this is great. I am leaving Cinkasse tomorrow morning, I paid 7700 CFA to go to Atakapame, and I will take normal collective taxis to Kpalime. Hang around with old friends, then hopefully cross the border there and slowly move across Ghana to Cote d’Ivoire. I am looking forward to stopping in Ho, Ghana to see what is up, and I am hoping there is a functional border close to Kpalime, Togo.